A high-precision GPS unit (on white “T” in foreground) records its position at a ground control point along Pohoiki Road. This marker was painted in July 2018 and is visible in numerous aerial photographs taken by Hawaiian Volcano Observatory geologists throughout Kīlauea’s lower East Rift Zone eruption last summer. GPS data are recorded over a period of four minutes at each location, enabling vertical precision of approximately 18 cm (7 in). USGS photo by M. Zoeller, 03/22/2019. 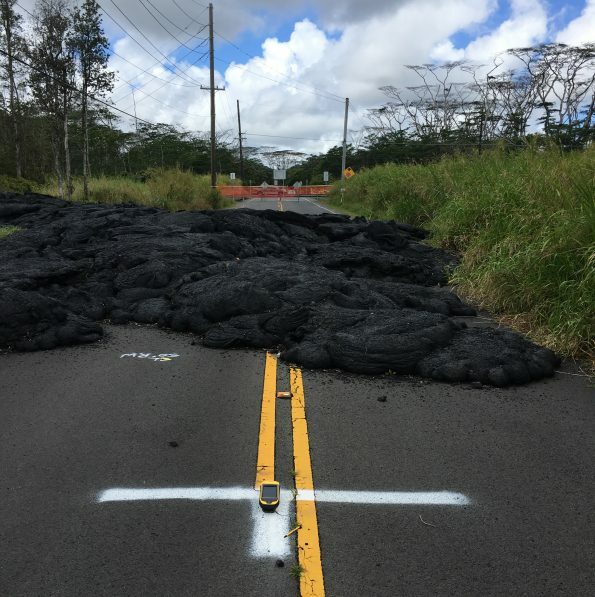 In February 2019, the USGS Hawaiian Volcano Observatory (HVO) released a preliminary map of lava flow thicknesses for Kīlauea Volcano’s 2018 lower East Rift Zone eruption. This map was produced by comparing pre- and post-eruption models of the flow field, a process described in greater detail in HVO’s March 7, 2019, Volcano Watch.